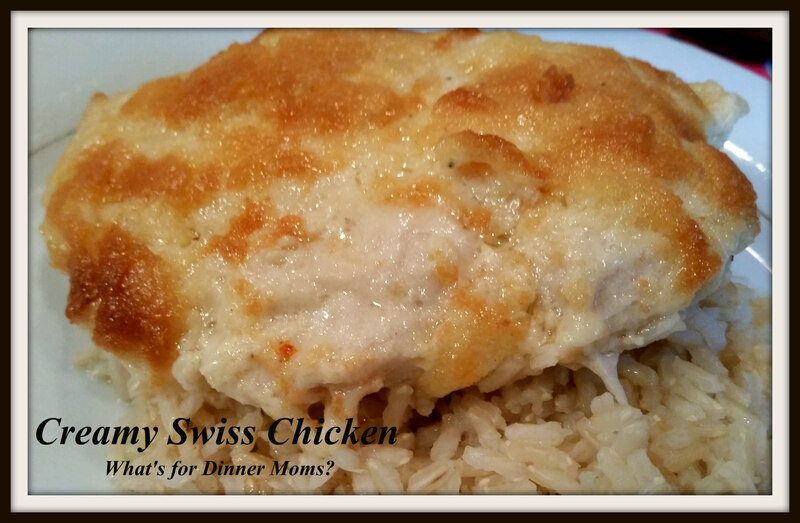 Creamy Swiss Chicken – What's for Dinner Moms? So I have finally decided to start doing something just for me. I joined a handbell choir. I have never played handbells before. It has been interesting. I realized I was being very hard on myself because I had a music degree I should be able to go in and pick this up like nothing. First of all there were all these notations on how to play the bells – thumb damp, martellato, echo…. that I had never seen before and the actual motion of playing the bells properly was a bit tricky to get down. I came home after the first rehearsal feeling a bit down about my abilities and my family looked at me and asked, “How long have you been doing this?” Yes, it was 2 hours but I was supposed to have this down! So, now I have taken a step back and am just enjoying spending a whole hour once a week with no one asking me to do anything other than to ring my middle C bell and my b bell. So I made this for dinner the night I had handbells because it was so simple! I had my daughter pound down the chicken. I think she enjoyed that a little too much. Then my son put the dish together and made rice while the dish was baking. This was a yummy, simple dish. Both kids loved that they had a hand in making it too. We added a little bit of butter to the rice and used the chicken juices from the bottom of the pan to pour over our rice. It was a nice flavorful dish. I served this with brown rice, carrots and a green side salad to complete the meal. Preheat oven to 375 degrees. Prepare a 13 x 9 casserole dish with non stick spray. Place chicken breasts in one layer in the bottom of the casserole dish. Place the Swiss cheese over the top of the chicken. In a small bowl mix together mayonnaise, 2/3 cup Parmesan cheese, and garlic powder. Spread over the top of the Swiss cheese. Sprinkle the remaining 1/3 cup of Parmesan cheese over the chicken. Bake for 40 – 50 minutes until chicken is cooked through and browning on top. Remove pan from oven serve over rice if desired. Previous Post What is Your Song? I may actually have to try this. It looks delicious and easy enough for me to actual make!!! Lol! It is very simple. My kids said the hardest part was pounding down the chicken. LOL! Well who knew Choir Bells have a learning curve!! 🙂 Enjoy the process of learning the new music, and bells! Hopefully you’ll share a little video of you and the choir doing your thing when you get the hang of it, and you will! Thank you. It is like learning a whole new instrument. I will have to post a video! My husband would love this. I think I will make chicken tonight. I have not made it in quite a while. Hope he likes it. We eat TONS of chicken. It is cheap and fills my family up. Thank you Lynne for your encouragement! Hand bells – I love them! A Hand Bell Choir is simply fabulous and I love them. I have seen several and always wanted to play, but I find myself swept away by the beauty of the music….you will love it!! Thank you! I just have to get over myself! Lol. Thank you. Awe, this is easy. Pounding down the chicken was the hardest part. Darn straight they’ll attend your concerts! Congrats on picking up a hobby! Chicken looks so good I can smell it!